Bingo is everyones favorite educational, vocabulary game, right? If it isn't, you must be doing something wrong. Picture bingo is the absolute best! 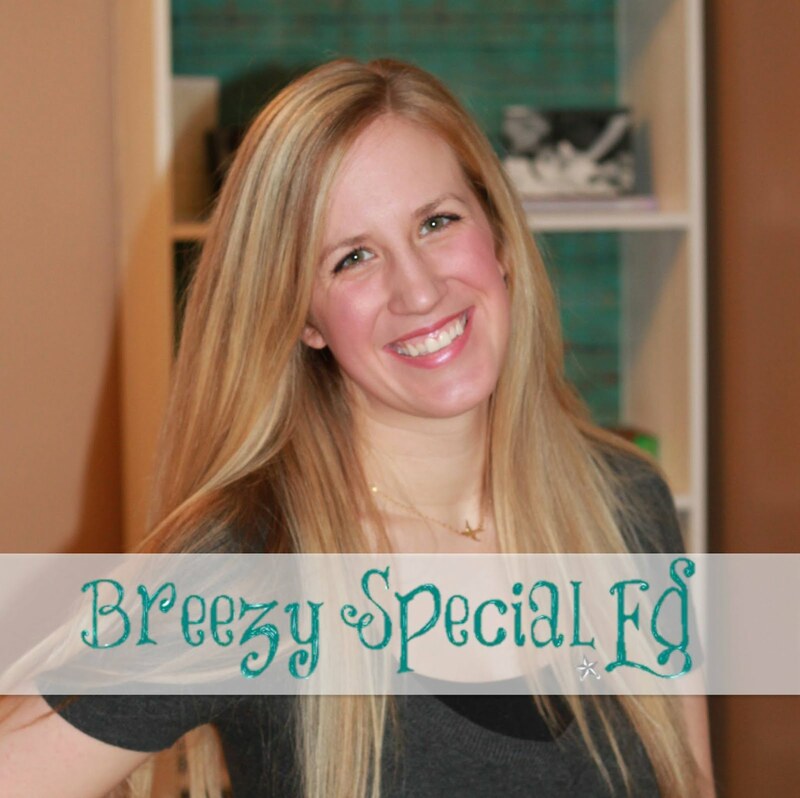 It works on so many skills, keeps kids involved, and adds some fun into your everyday lessons. 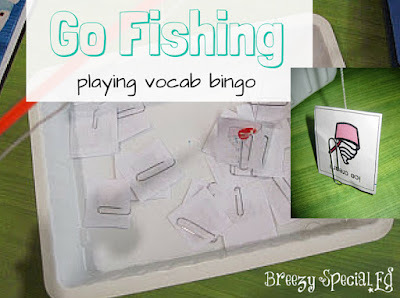 We use bingo when working on various vocabulary skills and while discussing various topics or community outings. I usually pick out a card, talk about it...("This is something healthy at the grocery store, it's in the produce section, carrots and beans are some of these, VEGETABLES! Find vegetables on your card.") and then I will be sure to show the card to my students so that they are able to match if they can't find it. I love playing bingo in a variety of different ways in order to keep things interesting and also to work on additional skills. Here's some of my favorite ways to switch it up! Object Discrimination: Instead of calling cards, if you have a projector, type the name into google images and show the pictures and the students have to state what they see and find it on their cards. Money Skills: Instead of bingo chips, use coins and have students “put the quarter on the ____”, etc. A great way to sneak in some money math skills! Put paperclips on the calling cards and use a magnetic fishing pole (find it at the dollar store) to have students fish to call the next item! Storing ALL those BINGO boards! Now, let's talk storage. 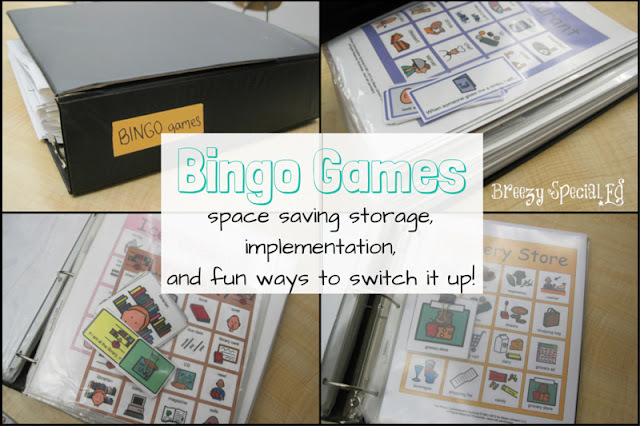 If you love bingo as much as I do (and you should), you will have a lot of bingo games! The easiest way for me to organize my bingo boards is in page protectors in a huge binder. I store all of the cards for one subject in one page protector, along with the calling cards. I DO NOT laminate my bingo boards. If I give a board to a student who is rough with their paper, I put their bingo paper into one of these clearboard sheet protectors. I do usually laminate the calling cards, especially if we are fishing or letting students run the game. Plus, I often using the calling cards as vocabulary cards as well. I love it when things have a dual purpose! Do you ever have bingo games that come without picture calling cards, I just cut up an extra bingo board. I also find that bingo games make for excellent sub plans, especially when you need something at the last minute! How else do you use bingo games in your class? You can find these bingo boards (and more) in my community units. For holidays and common themes, I usually have good luck finding bingo boards with a google search! I love Bingo too! This last year I started using g them for my Life Skills class and it really helped with learning new vocabulary!Great storage idea!